Last week, we told you about an upcoming (and yet to be announced) Motorola/Lenovo smartphone that could be called Moto G4 Plus and may feature a fingerprint sensor on the front, just below the screen. Now, thanks to a leakster from China, we can take a look at two photos that reportedly show a Moto G4 (this time, the "Plus" part of the name is missing). As expected, this alleged Moto G4 does indeed have a squircle-shaped button on the front (most likely including a fingerprint scanner). 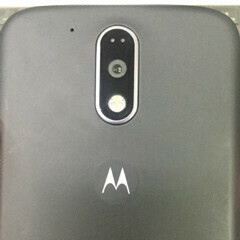 On the back, we can see the famous M (Moto) logo, plus a camera with LED flash and two other mysterious sensors. This device looks a lot like the one pictured earlier this month and presented as a possible next-gen Moto X flagship. Motorola will probably release both a regular Moto G4, and a Moto G4 Plus, though for now we don't know what's going to differentiate the two handsets (we can, of course, assume that the Plus model will be larger). The Moto G4 and Moto G4 Plus could be announced in the near future alongside new Moto X and Moto E phones. As you may know, Motorola didn't launch any handsets this year, so it's about time for the company to show us something new, isn't it? waite till we see the whole thing to be revealed. looks fine to me. Why didn't they put the fingerprint scanner in the Moto dimple on the back? That would have been one of the most obvious design choices. What the heck lenovo? Looks boring. The new metal bodied Galaxy J series will sell better than these. Should not cost more than $150, why pay more when the name Motorola is not worth $179 anymore. Number 1 - uses mediatek Number 2 - front speaker is gone Number 3 - possible updates may be reduced under lenovo's supervision. Number 4 - Lenovo Vibe K5 and K5 Plus is around $150. Been done with Moto since the DROID Maxx. Note 3, Note 4 & soon to be in the Note 6 when it drops. This is not the Moto flagship, it could just be the Moto G shipped with a fingerprint sensor. Many other companies have shipped their lower end phones with fingerprint sensors before. Also look at the material. It is plastic with out any metal on the side. It is just their middle or lower end product. Only thing I care about with this phone is price. It needs to be $299 or less to even matter in this insanely competitive market. if Lenovo wants to interfere in the Motorola phones then why are they keeping the Motorola brand anyway. As if they will improve the quality of the phone ! Never understood why all phones have to have a cutout for fingerprint scanner. Couldn't they just make it flush with the chin of the phone since most use glass? And maybe a print logo indicating where to put your finger.